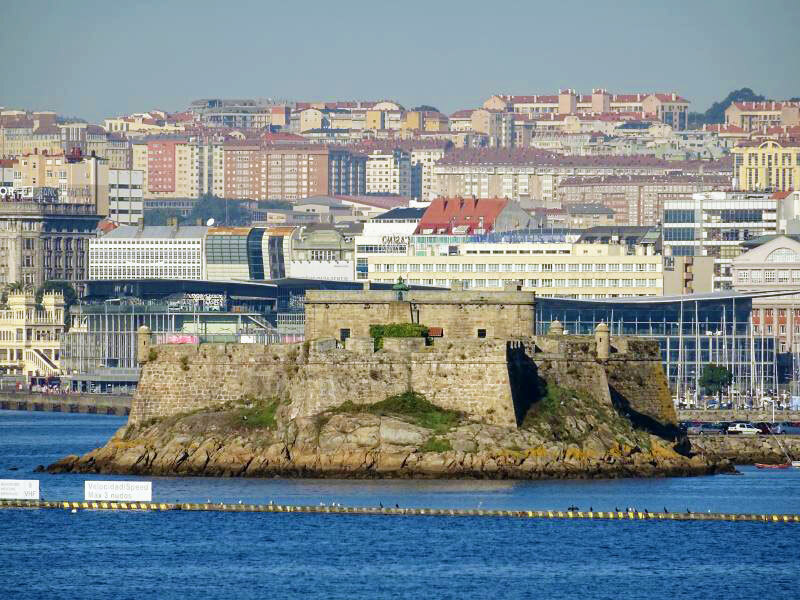 We arrived in the port of La Coruna amidst the beauty and grandeur of the Tower of Hercules and a magnificent example of a Spanish Fort. 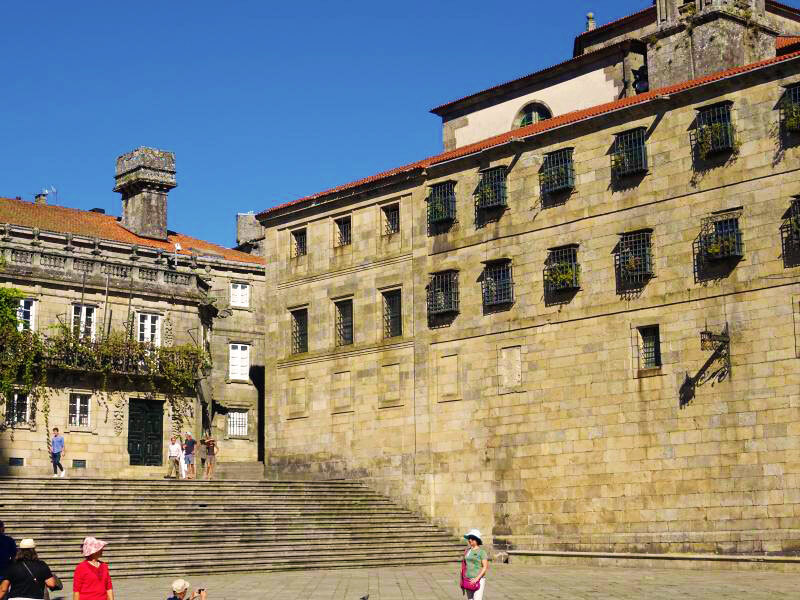 After mooring the Navigator of the Seas we departed on a 1-hour drive to Santiago de Compostela on the Santiago Extended Half Day Tour at 1:35 pm. 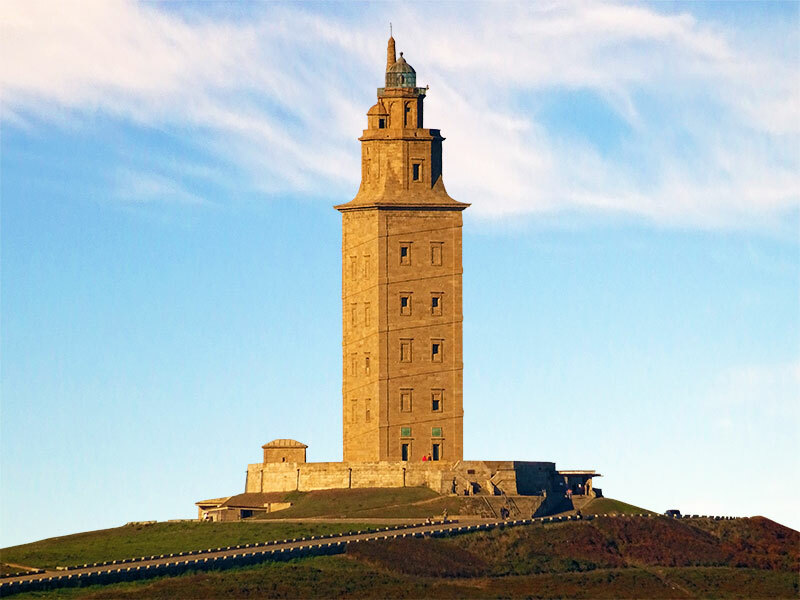 The Tower of Hercules - ancient Roman lighthouse. 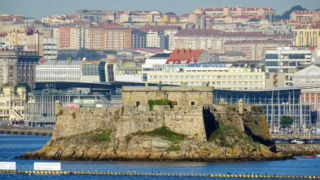 Antigas Murallas de Coruna - The Walls of Coruna. 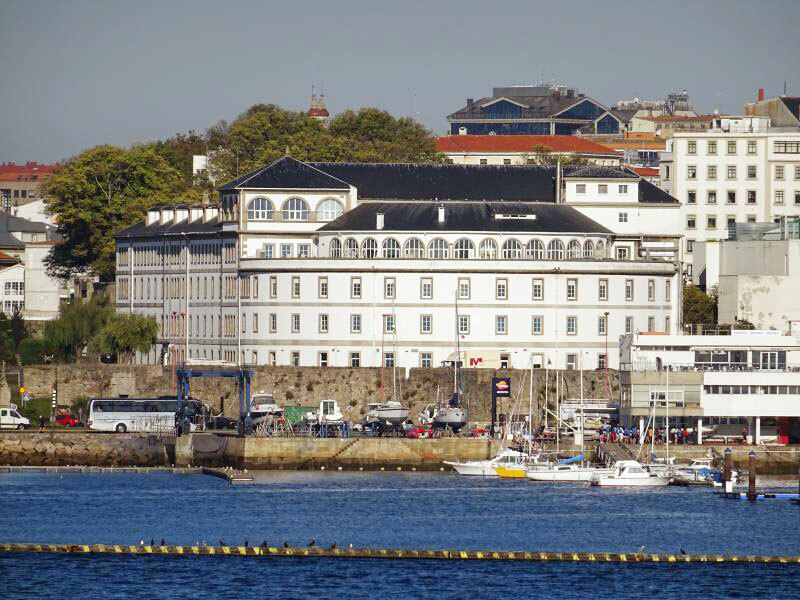 The city center of La Coruna lies on a peninsula connected to the mainland by an isthmus. 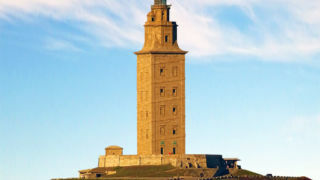 Not far from this epicenter is the Tower of Hercules, the oldest in-service lighthouse in the world. 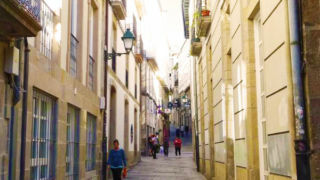 The area is home to the largest shopping center in Spain known as Marineda City. 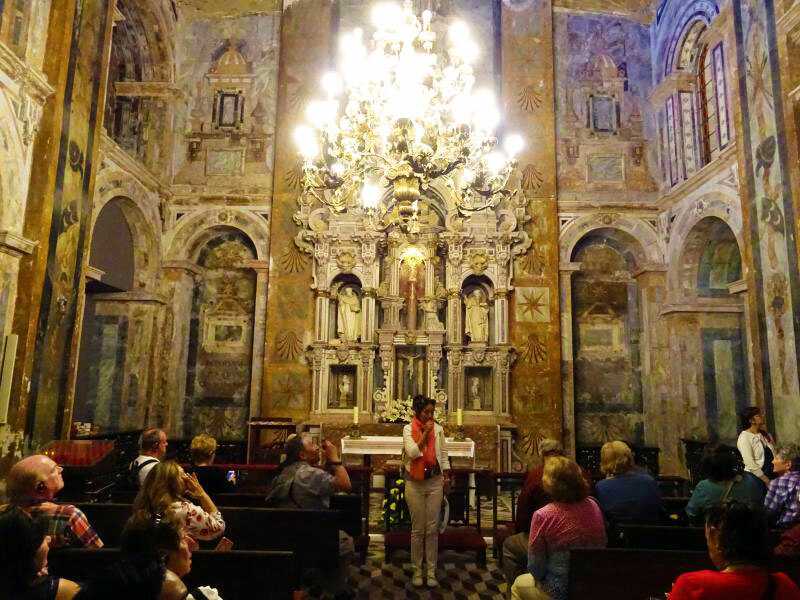 During our ride to Santiago de Compostela, we learned that the Romans occupied Spain from the 4th century BC to the 4th century AD. Julius Caesar arrived here around 62 BC. 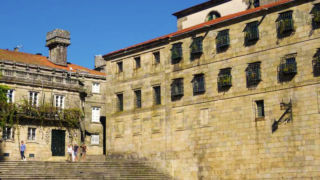 At 2:40 pm we reached Darsena de Autobuses en Juan XXIII, Santiago de Compostela. 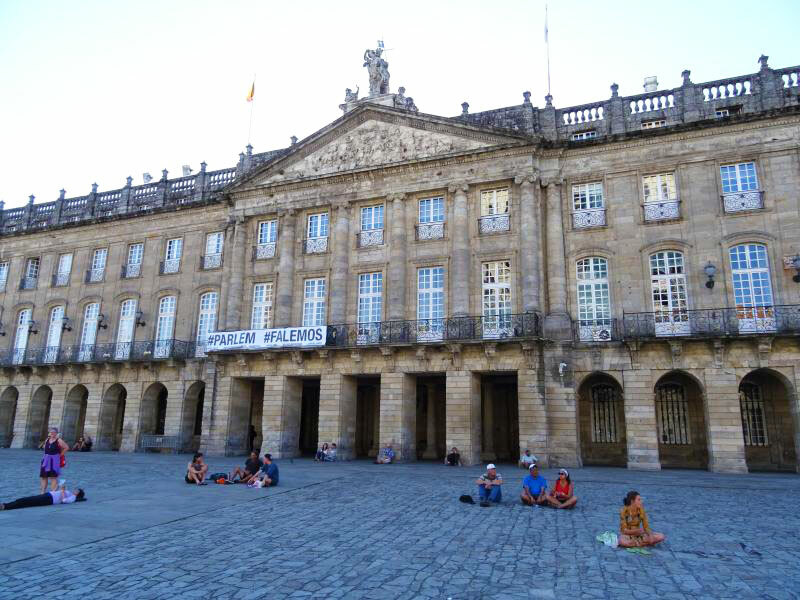 We strolled to Praza do Obradoiro square, the designated meeting point. 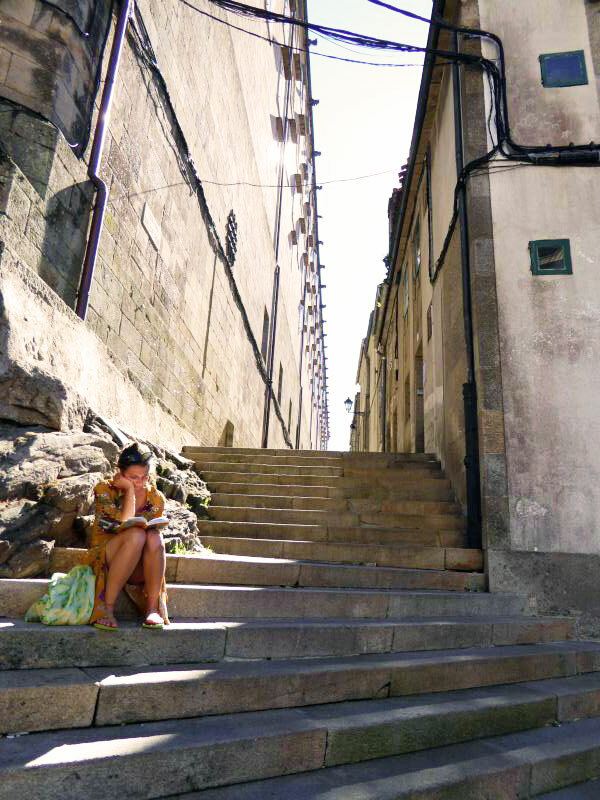 A local resident and the streets of Santiago. 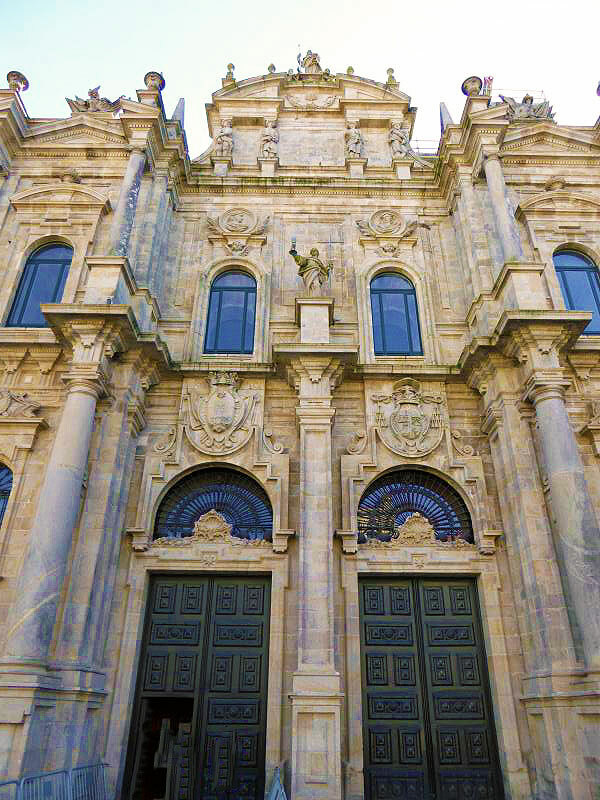 Iglesia de San Francisco, Catholic Church. Raxoi Manor and local government offices. 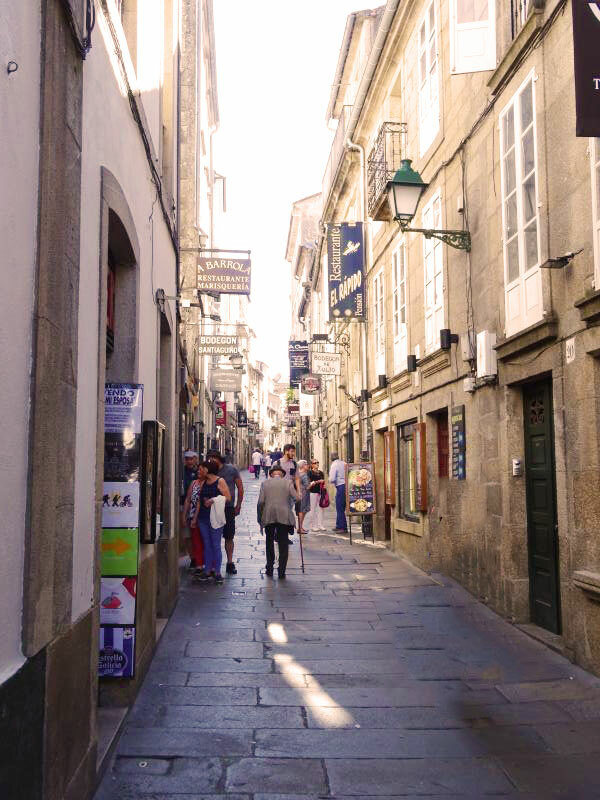 While in Santiago de Compostela, our options included staying with the guide or exploring on our own and meeting up with the group at 6 pm. 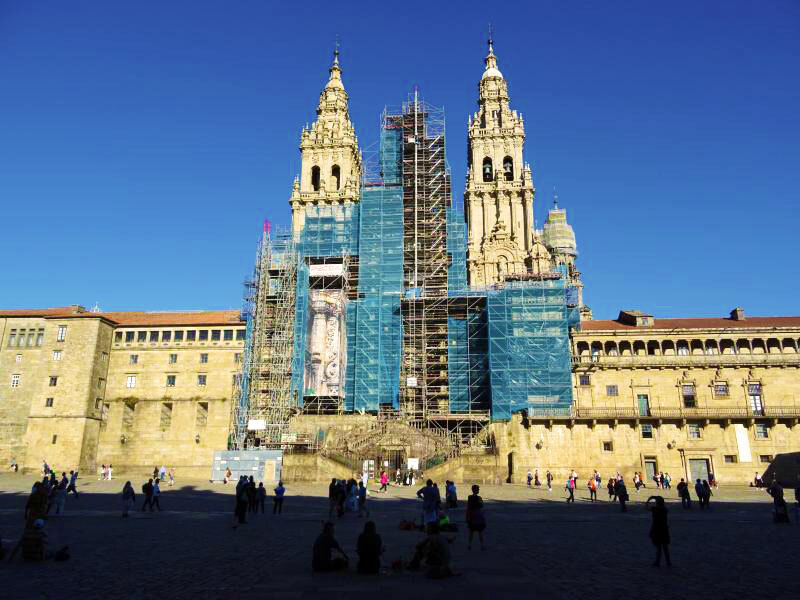 We elected to stay with the guide and view the interior of the Cathedral de Santiago de Compostela and its surrounding streets. 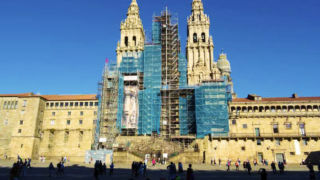 Stonemasons built the magnificent Cathedral de Santiago de Compostela between the 11th and 12th centuries. 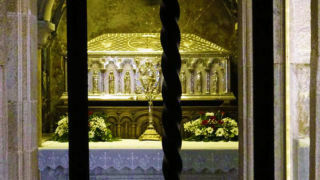 Compostela means star and references the hermit who discovered St. James’s ashes. 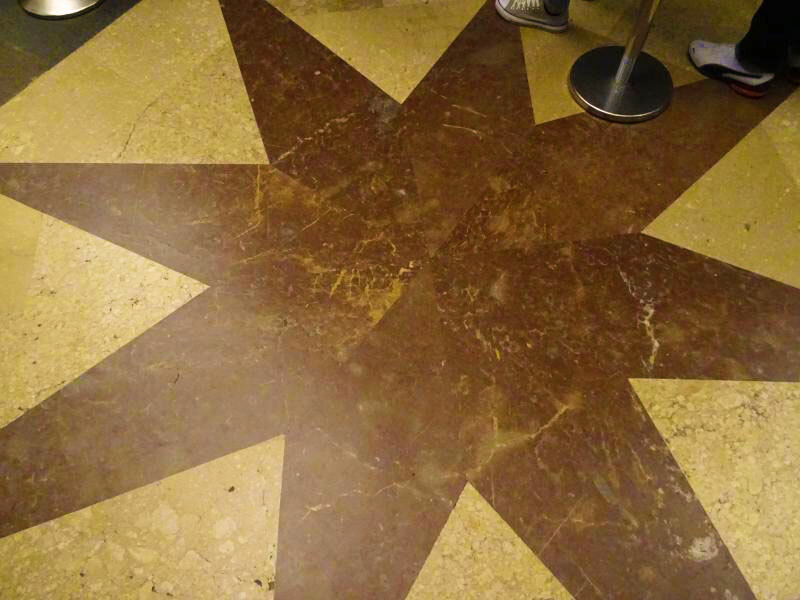 After entering the cathedral, our eyes gazed upon the highly adored altar. 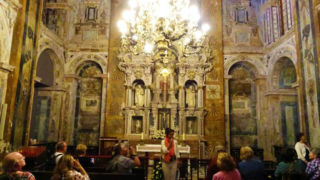 We sat in a pew and took in the shapely embellishments while watching devotees of the church hug the sculpture of St. James. 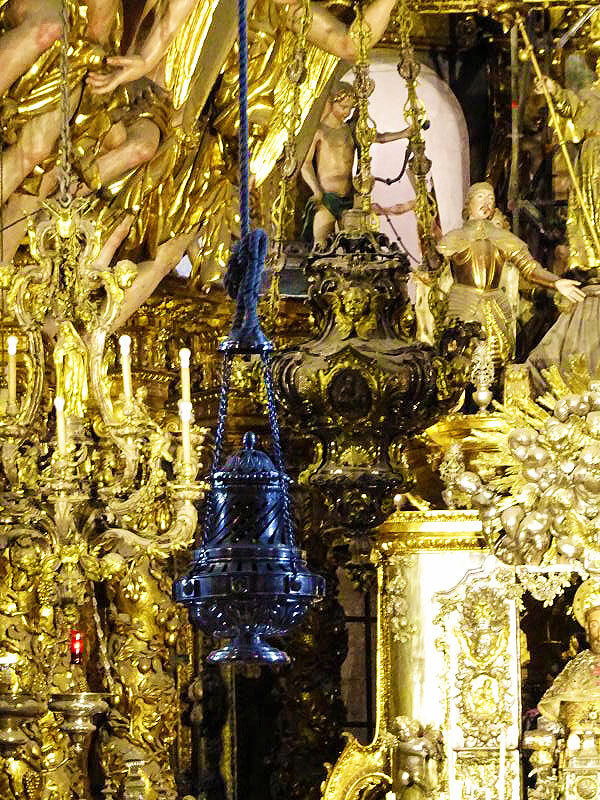 From our vantage point in the center of the cathedral, we recognized both the silver and gold incense chalices used in special ceremony. Next, we noticed the Our Lady of the Pillar shrine and saw the Holy Door. 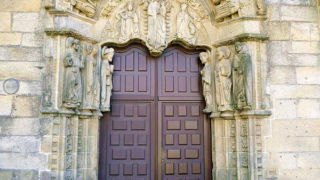 As with St. Peters in Rome, priests open the highly adored holy door only once every 11 years. 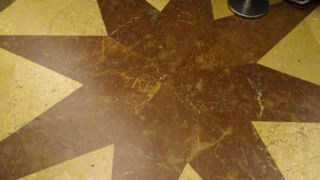 Beside the door, imprinted on the floor, rests the image of the star of the Hermit. 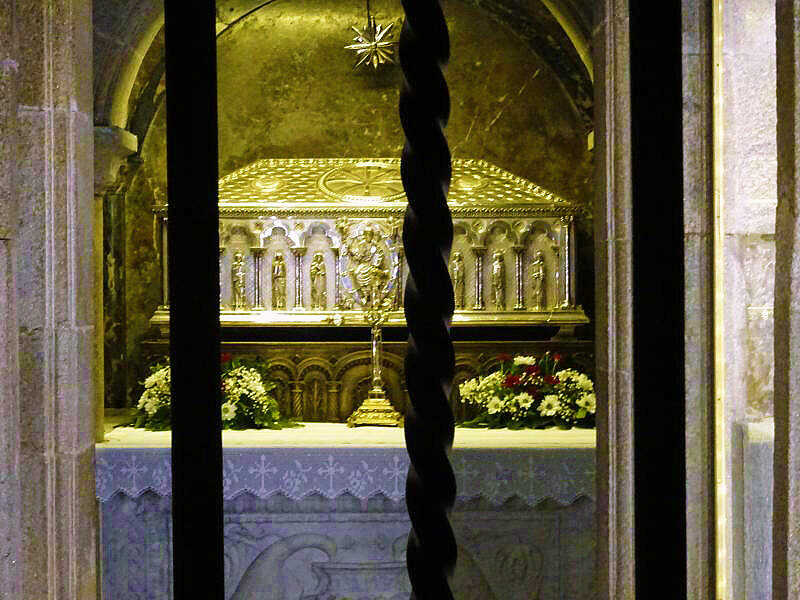 Looking through a smaller door behind the high altar, we observed the Crypt of the Ashes of St. James. 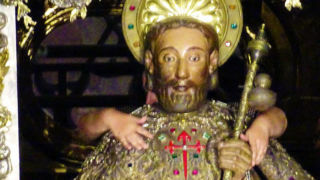 A parishioner wraps their arms around the statue of Saint James from the high altar. 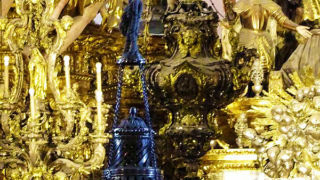 Two incense burners used during mass at the Cathedral. These are around 5 feet tall and weigh 175 lbs. 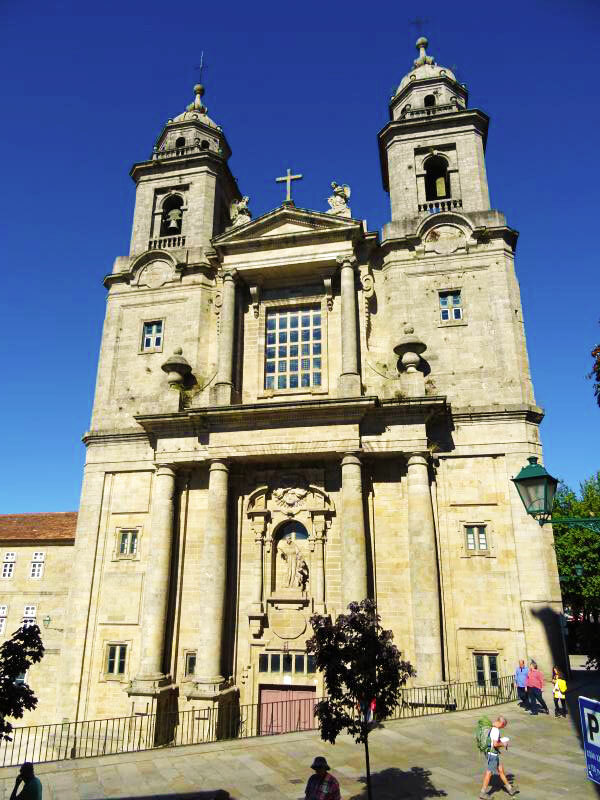 Reliquary chapel of Saint James, which is under the high altar of the Cathedral of Santiago de Compostela. 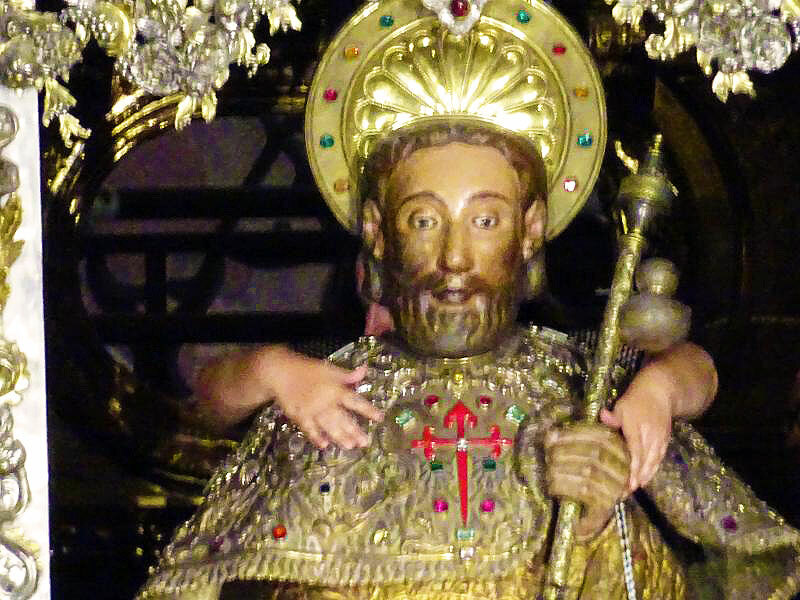 Symbolic star for the Hermit Pelayo who rediscovered the remains of Saint James. 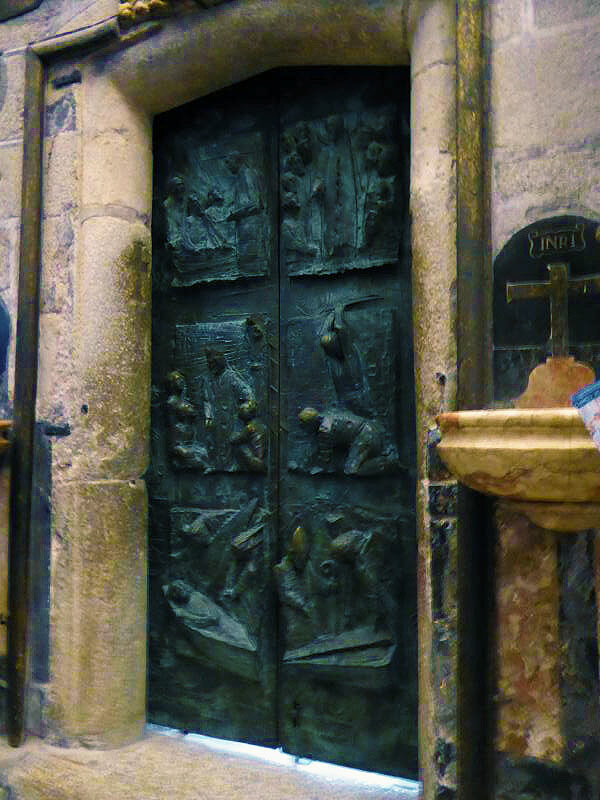 The Holy Door of the Cathedral of Santiago de Compostela from inside. 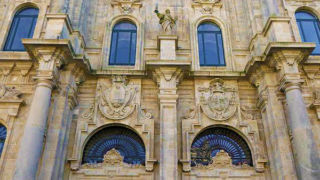 Chapel of Our Lady of the Pilar. 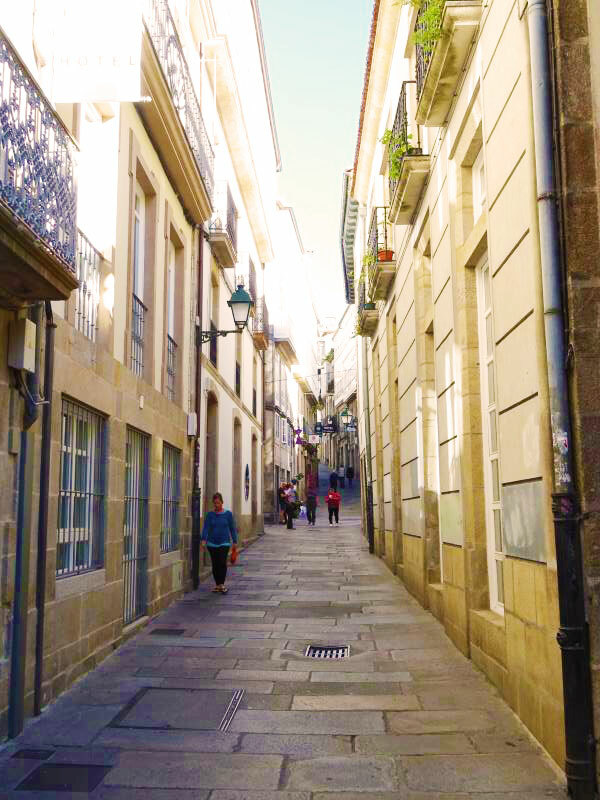 As we exited the Cathedral, we found ourselves standing in a wide square, Quintana de Vivos and Quintana de Mortos, divided by a staircase. 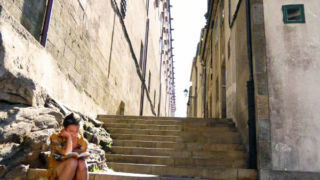 At the bottom of the stairs is the surface entrance to the Holy Door. 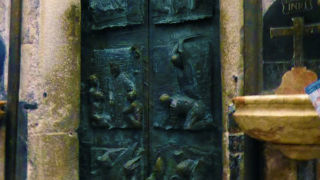 The intricate images surrounding the facade of the door are 800 years old and once resided inside the church. An annual, 62-mile pilgrimage ends at this entrance. 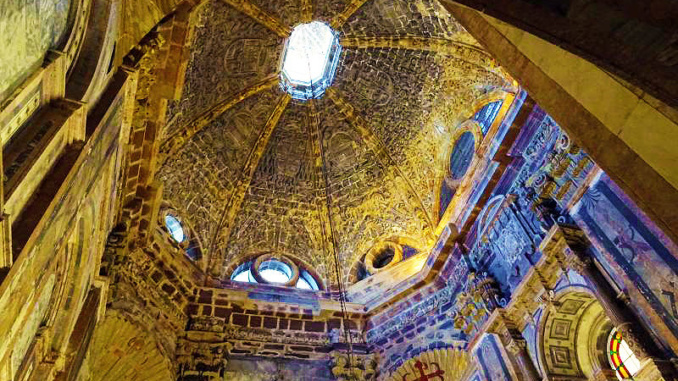 Monastery of San Paio de Antealtares. 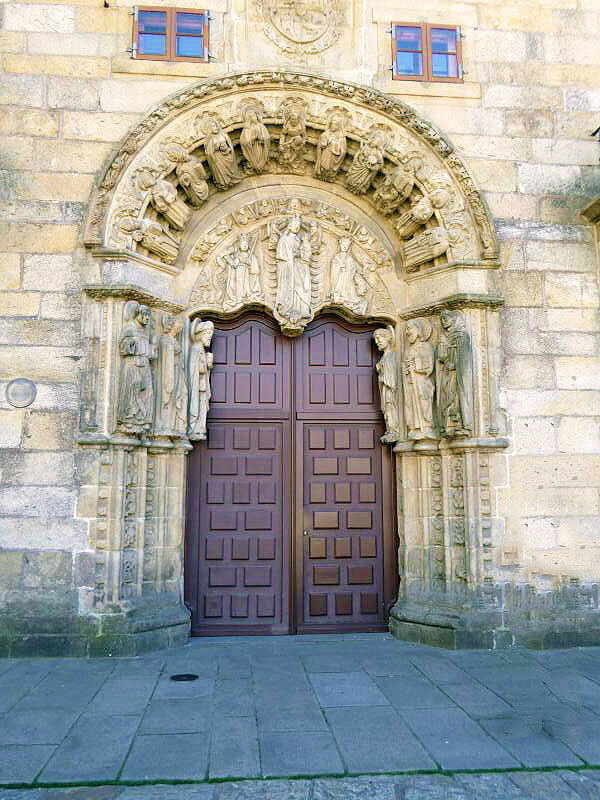 Side entrance to the Cathedral of Santiago de Compostela. 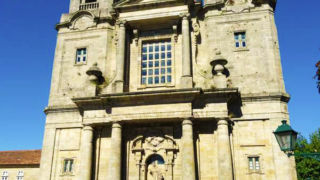 Front entrance to the Cathedral of Santiago de Compostela. 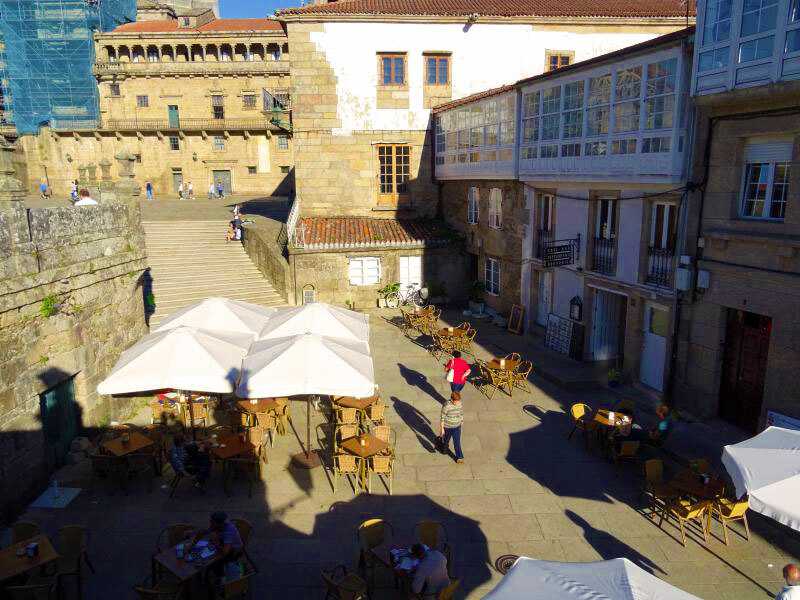 After returning to Praza do Obradoiro square, we had one and a half hours to spend on our own. We wandered the charming streets and stumbled upon Newroz Doner Kebap restaurant at Avenue de Figueroa. 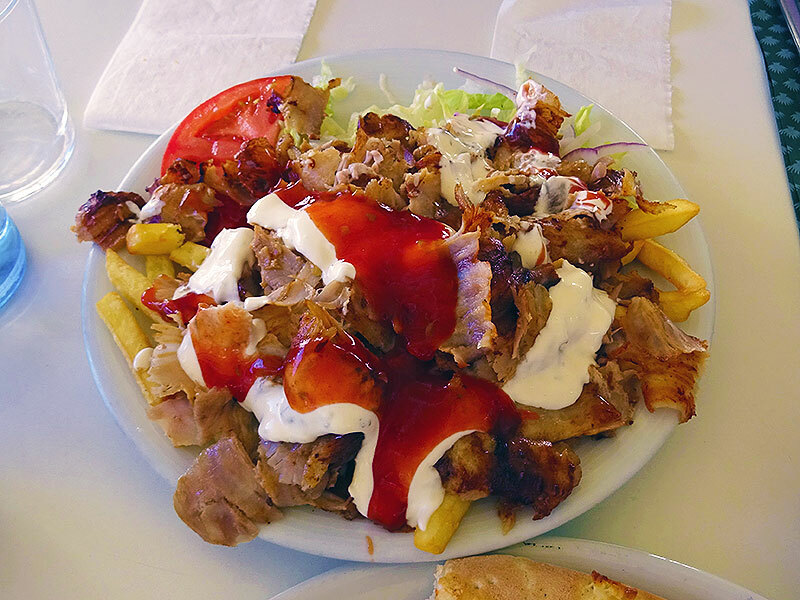 We sampled their delicious Diavola pizza and tasted the Plato Doner Kebap con Patatas (Kebab dish with potatoes). The meal totaled 14 Euros which included our drinks. 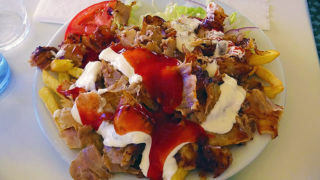 Plato Doner Kebap con Patatas - thin sliced pork over potatoes. 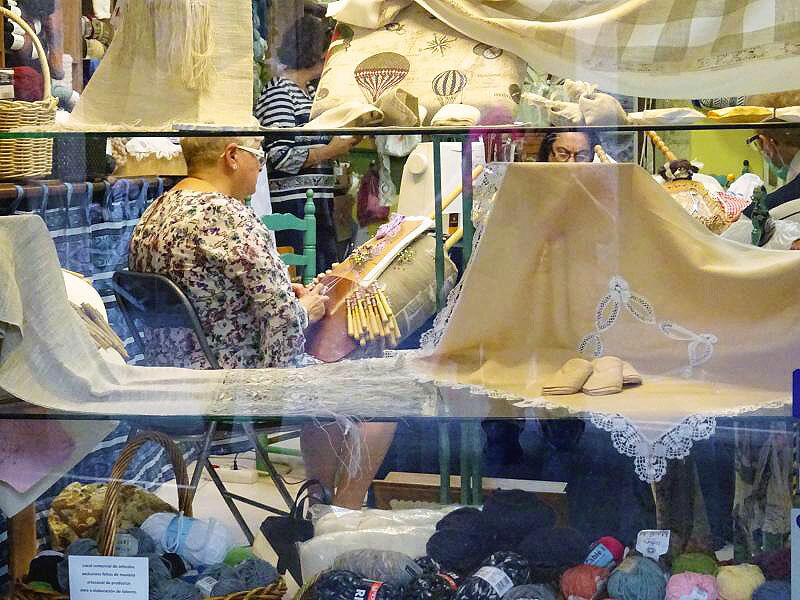 A knitting shop in Santiago. 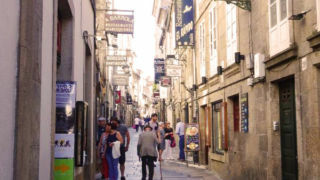 A residential street in Santiago. 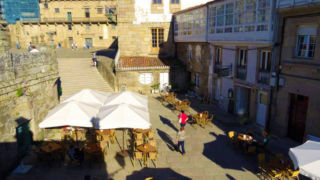 An open air restaurant, Cafe Raxoi, in the center of Santiago. After our late lunch, we purchased a box of Casal Coton Caprichos. We learned that practically every store in Santiago sells these Spanish almond cookies. 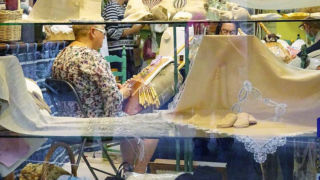 We also took the liberty to sample an array of Spanish cake, a specialty carried by many of the shop owners. At 6 pm we met our group at the meeting point and started the ten minute walk back to the bus stopping briefly at the information center. 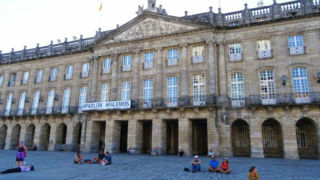 Here, I purchased a Santiago de Compostela commemorative coin for 3 Euro from an automatic machine. This coin is a perfect supplement to my memorabilia collection. 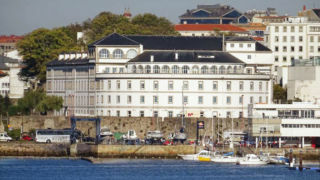 Our bus departed the depot at 6:20 pm and returned to the cruise pier one hour afterward. The tour and our guide made for a memorable day.